Total Sweet Sugar Substitute is completely natural. This low carb, low GI sugar alternative brings many health benefits, making it perfect for dieters, children, and anyone concerned about oral health and general well being. Total Sweet can be used in all your favourite recipes in exactly the same way as sugar. Whether you are baking or simply looking to add sweetness to tea, coffee, fruit or cereals, Total Sweet offers a healthy choice. Xylitol. Suitable for vegetarians and vegans. 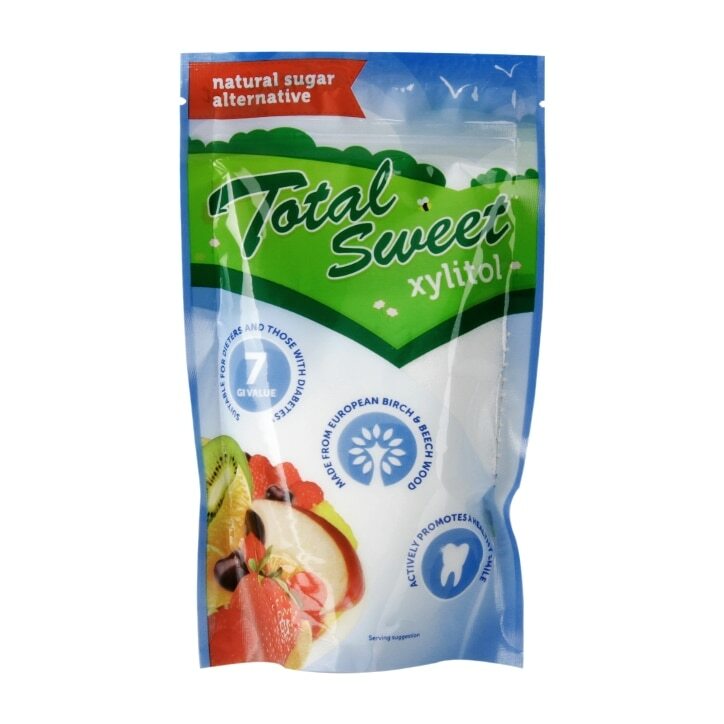 Total Sweet Sugar Substitute is rated 4.6 out of 5 by 39. Rated 1 out of 5 by Rosie1949 from Nothing like sugar! I have an unconquerable sweet tooth, but when I was diagnosed as borderline diabetic, I switched to sucralosose. As I have been unable to obtain this just recently, I thought I would try Xylitol. It also appeared cheaper. It tastes nothing like sugar, you need twice as much to give anything approaching the taste, so it is actually more expensive. I shall go back to sucralosose as soon as possible. Rated 5 out of 5 by Sunshine4me from Tastes great. I am trying to cut down on sugar, and there are so many choices. I find that Xylitol is a good substitute, it's half the calories, and it tastes good. Can't ask for more. Rated 5 out of 5 by Dee71 from Sugar texture.. no aftertaste ! This was recommended in diabetic recipes and it was for good reason.. can be used exactly like sugar, tastes like sugar and has no chemical aftertaste like aspartame.